"Remember: high speed, low pressure. Be confident, and hold the drill straight and steady." When I first started Dunn DIY, I really didn't know much about working with power tools. I approached them with so much caution that projects took me twice as long as they should have taken, and I was never getting to use the tool's full potential. In this series, I'm sharing everything you need to know about tools so you can DIY with confidence. 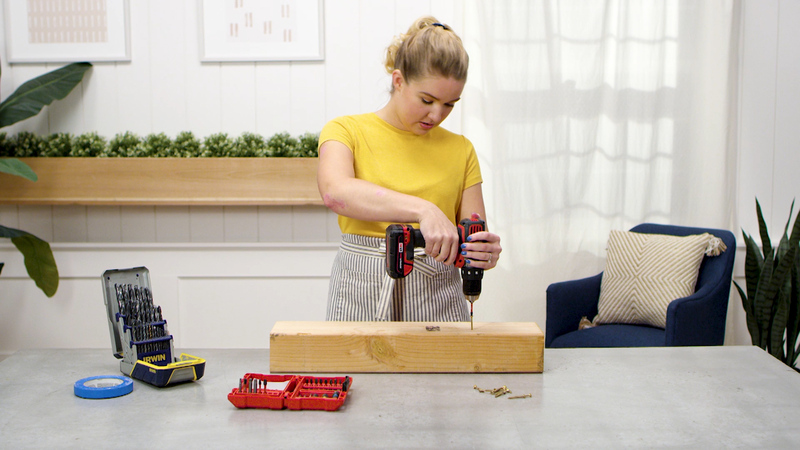 In the first part of this series, we talked about when to use a power drill. 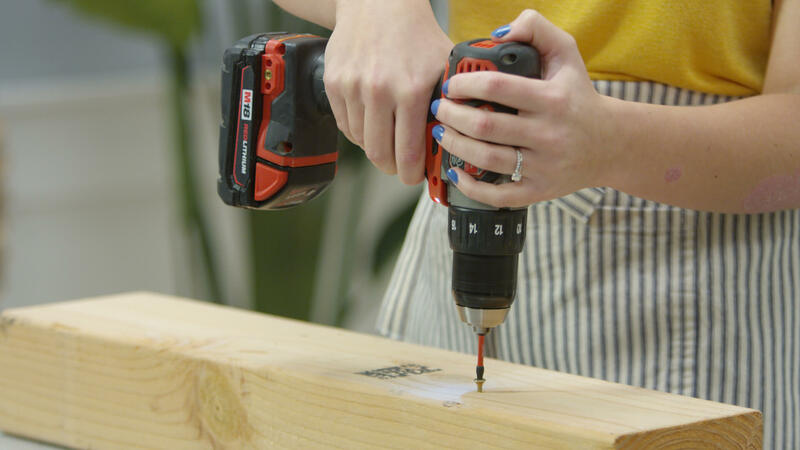 In this post, we're learning about one of my favorite tools (and the tool I'd most recommend adding to your toolbox if you don't already have one): a power drill. It's so handy to have around the home, and it makes most projects easier and faster to complete. Stay tuned for our next installment, where we'll cover which power drill to use. As a rule of thumb: Anything that makes you feel safer is a good idea. You can wear earplugs if you like, but a power drill isn’t all that loud, so we usually skip those. Safety eyewear is always a smart choice. A very thin drill bit can break easily, and that broken piece is going to fly somewhere—on the off-chance it flies toward your face, you want to protect your eyes. People assume that slower is safer. When it comes to drilling a hole, the key is high speed and low pressure—otherwise, you might end up with your drill kicking back (especially when you’re using a spade bit or a hole saw). Let the drill do the work—that’s what it’s for, after all. And remember that a power tool obviously has more power behind it than you do. With that power can come a loss of control and dexterity, so keep that in mind. When I first started using a power drill, I was extremely cautious and light-handed. I wasn’t used to working with wood, and quickly learned that I needed to be more aggressive to make the most of a power drill. Yes, the power drill is there to do the work for you, but you still have to put some weight behind it. When you’re using a power drill, be confident. While high speed and low pressure are good for drilling holes, it’s best to start with a slower speed when you’re driving screws and increase it as you get more comfortable. Here’s a tip that will speed things up: when you’re drilling a hole with a drill bit, drill down as far as you need to and, with the drill still running, pull it straight back out. Most people put the drill in reverse to back out of a hole—you don’t need to do that! This step not only saves you time, but it’ll help you learn how to be more confident and comfortable with the tool. For today’s purposes, we’re going to assume you’re pre-drilling before you drive your screws. Pre-drilling is done to prevent wood from splitting (say, when you’re working with a delicate material or need to drive a screw near the edge), or when you’re working with a tough material like metal. Pre-drilling isn’t always necessary, so use your best judgment. You should choose your drill bit based on the length and width of your screw. The length and width of the drill bit should match the length and width of the shaft of your screw. If you line them up and hold the drill bit in front of the screw, you should see the threads of the screw behind the bit and nothing more. (These threads are what give screws their holding power.) Sometimes, the length of your bit will be shorter than the length of your screw—there are tricks for this, which we’ll get to in the next step. If the chuck (the teeth that tighten and loosen to hold the drill bit) is really wide open and you’re putting in something really small, it can end up with the drill bit caught between the teeth. I like to tighten the chuck part way before I put in the bit. If you’re using a longer screw, go for a long drill bit. If you’re using a shorter screw, push the bit in as far as you can so the exposed part is only as long as you need. Another option, which is good for when the bit is too long, is to tape off anything beyond the part of the bit you need. This will keep you from drilling too deep into your material (or through the entire project). My dad always taught me to put the bit in, then turn on the power drill and look at it so it’s just the bit spinning. If the bit is stuck between the teeth, it’ll be spinning off-kilter. Make sure it’s not doing that. Once the right bit is on straight, it’s time to pre-drill. Remember: high speed, low pressure. Be confident, and hold the drill straight and steady. If the power drill gets stuck while you’re drilling, you can pull it out and restart. Most times, if you just put a little more punch into it, it’ll fix it. Sometimes, cleaning out the wood shavings in the groove of the drill bit helps. Whatever works for you! Congrats! You pre-drilled your hole. Now it’s time to drive your screw. Loosen the chuck to remove your drill bit and swap it for a driver bit. Make sure it matches the head of your screw. You will likely be working with a Phillips-head screw, a square-head screw, or a Torx screw (also called a star-drive screw), but there are tons of options. The important thing is that they match. A good bit should fit snugly into the head of the screw without any wiggle room. Make sure you’re lined up directly over the top of the screw and make sure the clutch is on the right screw setting. You may want to start slowly, but you can increase speed. With the clutch set correctly, the drill will disengage once the screw is driven home, which avoids overdriving the screw. A note: When you’re first starting out, it’s not uncommon to strip out your screws. When you strip out your screws, the driver bit spins inside the head of the screw, forming a circle. This almost always comes from not lining up directly on top of the screw, so pay attention there! Getting the drill lined up when you’re first starting out is challenging, so check it from various angles. That’s it! Visit the next part of the series as I break down what power drills to buy.